Mom and Grandma came to town last week. They did dig the scenery, the thrift stores and Walnut Creek’s quilting shop. We didn’t make it to Napa, or drive along the coast, but it is good to have things to do for next time. We did make it out to Alameda to see Joyce and Harlyn, and we parked behind a bumper sticker that read “IMPEACHMENT HELL GET A ROPE” which Mom got a good chuckle from. She recounted this to Joyce, who is working now for theological scholars, and she answered that one thing she likes about her job is that even though she is a non-believer among serious religious folks, they feel the same about President George, whereas if one were to express themselves at the bank where she worked previously, that might cause some discord. And, while I like to have intelligent people I can argue with, it is nice to come to work and rap with our office manager, an intelligent person who offers that Monday has been magnified by the shift to Summer Time, and I demure “oh, don’t get me started on my rant about Daylight Savings Time,” and she goes “oh, I hate it too.” So, I got to rant a bit, “if you think waking up earlier is a good idea, then wake up earlier! Don’t screw up the clocks!” It felt good. The rant was augmented by some research I did on a lazy Sunday after dropping the folks at the airport. Because of this, it may at some point be composed in to an essay which I may post here, or at kuro5hin.org. And yes, I know it is called “Daylight Saving Time” without the s.
Oh, by the way, you WordPress users might want to go in to the Options menu to manually decrement your UTC, as WordPress doesn’t have a proper notion of timezones. FAQ: How do you measure swap utilization in FreeBSD? A: If you are writing a C program, check kvm_getswapinfo(3) and maybe take a gander at the bottom of /usr/src/usr.bin/top/machine.c. A while back, Al Gore bought a cable channel that replayed foreign news broadcasts. Yayoi and I used to watch the English-language Japanese news broadcast from Tokyo. Pretty groovy. Though, they never could keep to a straight schedule. Well, this puppy has had time to incubate and morph in to a new creature, that will air short videos of between two and five minutes, and they are inviting viewers to submit content. Sort of television meets Internet blogging. You know, doing taxes really isn’t that bad. And, if my math was correct, we will receive a substantial refund with which to pay off much of our credit card debt. I skipped the state taxes, because I was in two states, and each wants to see the paperwork for the other, and, well, I would likely receive modest refunds that would otherwise go to fund schools, or something. But mostly I am just lazy. I just read the most stunningly bizarre story in the Baltimore Sun. It is about Mike Bolesta, who bought a car stereo for his son, but Best Buy gave him one that was too big for the car, then offered him a cheaper one, waiving the installation fee because they shouldn’t have sold him the wrong one in the first place. Then they called him up and said that if he didn’t pay the installation fee, they would call the cops. So, irritated, he goes in there the next day and pays in $2 bills. Not only is every last employee at that Best Buy stupid, but the Baltimore Police are evidently wack-jobs as well. After some hours in handcuffs and leg irons the Secret Service comes along and explains that his currency is legal-tender, and that yes, it is not unheard of for a bit of ink to rub off of legitimate US currency. ObTip: Use BugMeNot to bypass compulsory registration. It actually took me a few tries. ObIdealism: stratusmonkey declares April 13th is “Two Dollar Bill Day” to commemorate the life and career of President Jefferson, and remind the American public that the paper money bearing his likeness is legal tender. Would I still be your honey? Asked another: Quicken? Have you looked into gnucash? 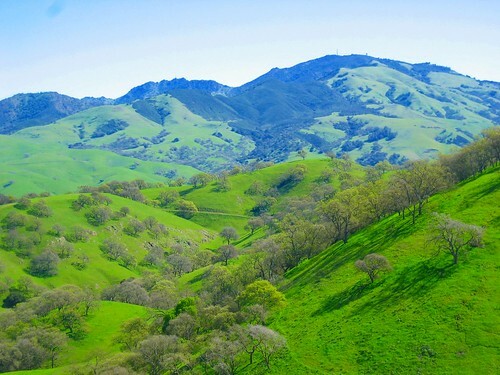 A color-enhanced view of Mount Diablo from the foothills above Walnut Creek. The rain has made things green and a quick trip to the GIMP only emphasizes this. Yayoi is not currently employed. Yayoi does not speak in British euphemisms. Yayoi does not speak melodramatically. Yayoi can not hold her liqour. Otherwise, I totally feel her pain at being layed off . . . what was my subconscious mind doing? 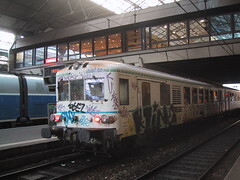 A graffiti covered train, in Lyon. I have been uploading a lot of photos via Flickr lately. I purchased a “pro” account for $42/year (now $25/year) in part because they have a “blogging” interface with which one can post photographs to one’s blog. They’ll also retain my original image files, and promise to get around to a “bulk download” facility so I can use them as a “disaster recovery” mechanism as well. On top of that, the site has nice features and is definitely zippy. Anyway, I like this photograph. It is a train, covered in beautiful graffiti, in France. I like all that stuff. And I like that Flickr will store the image for me and provide an interface for re-posting it here. I will be uploading many more photos over the next few months. All images taken in 2005 are online, and I’m making my way through the 2002 “World Tour” in alphabetical order right now. Flickr only allows me to upload 1GB/month, (actually, they just changed it to 2GB,) even with a Pro account. This is fine, because I have so many photos, I ought to take my time sorting through them. Increasingly, prospective and existing customers are interacting with corporations electronically, both for research and purchasing purposes. Those that ignore online inquiries are alienating consumers–especially young “affluents,” the 24- to 33-year-olds earning $75,000 or above who are the heaviest Internet users (and most likely to be asking the questions). In fact, our research indicates that 70 percent of consumers go to a competitor’s site if they don’t receive a timely response to an online inquiry. And losing those customers is a faux pas few companies can afford. I don’t really need to read the rest of this CNET article because I already know all I need. Companies, fear my “affluent” wrath!! MUHAHAHA! !